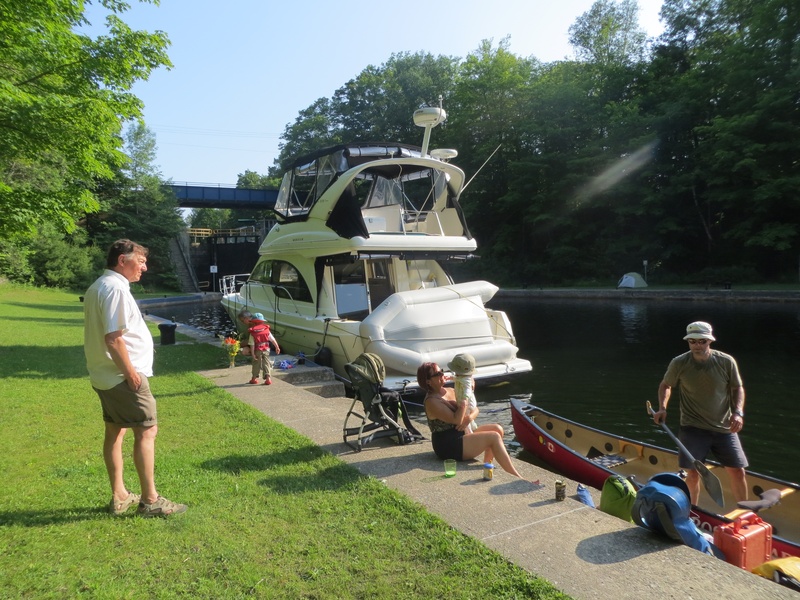 Family photo at Hagues Reach lock on the Trent-Severn Waterway. The Trent-Severn Waterway is made up of 44 locks over 386 kilometres (210 miles) of interconnected lakes and rivers stretching through central Ontario. It was founded in 1833. After many, many kilometres of portages during this trip, we were happy to travel through this marvel of engineering. Unfortunately, due to changes in the management of the locks, we were forced to camp early some evenings. We even had to portage around one lock or else sit for 1 1/2 hours waiting. The Lockmasters were very helpful with local tips, camping, keys to the washrooms, and where to find cold drinks and ice cream nearby. There are many interesting names for the locks. This is a photo of Lovesick lock. Many of the Lockmasters take a lot of pride in their stations. At Lovesick lock, there were flowers planted in a tree cavity. Beautiful! Camping at Meyers Lock. Always nice to have flat grass and picnic tables. There are 39 swing bridges on the TSW. Boats blow their horn to let the operator know that they would like to get through. Approaching Peterborough lift lock just before a huge downpour. A boulder left behind by the glaciers near Youngs Point lock. These limestone layers were prevalent in many places along the TSW. They are often sitting on top of exposed Canadian Shield. We discovered St. John’s on the Rock church on an island in Stoney Lake. It sits on the Canadian Shield and is open only in the summer. Nothing better than getting “free miles” sailing while Rane is sleeping. Rane loves Jude. He gives him big smiles whenever he stops by. Rane has some good naps in the canoe. Sometimes he ends up sleeping under my seat. When 3 year olds need to go, it means you have about 30 seconds to respond. We have a potty for Jude to use – then we dispose of it as you would for your dog. This boat was moored at the Lakefield Marina. Gave us a little chuckle. Unfortunately, we didn’t get to meet the ShagMaster himself. This turtle surprised us by swimming right next to the canoe. This fox crosses the lock all of the time, according to the Lockmasters. She had also passed through our camp the evening before. This porcupine couldn’t find his way across the lock. He didn’t think to use the bridge – not as bright as the fox. The last day that Taq paddled with us in the canoe this summer. One of the reasons we chose to paddle the Trent-Severn Waterway is because Geoff has family living between Orillia and Peterborough. It was a chance to experience the waterway through the area he grew up in, and to visit family we seldom see now that we live in Calgary. We couldn’t turn down the warm invitations we received from Geoff’s relatives to stay at their homes and use them as base-camps, meaning we could paddle day trips: picking up each morning from the spot we left off the night before. We never knew how far we would get in a given day – there are a lot of factors: kids, locks, wind, visiting… We appreciated everyone’s flexibility and creativity when it came to finding a place to stop for the day and store our canoe. Their friendly faces were a welcome sight after a day of paddling. We had a wonderful time eating delicious meals, imbibing cold drinks, and catching up. Jude and Rane got to meet many of their great Aunts and Uncles. After leaving the Orillia area our base camp shifted to Bobcaygeon. Katy (Geoff’s mom) shuttled us between Dave and Marilyn Kittle’s house and the drop off locations for paddling in the area between Kirkfield and Bobcaygeon. We had a wonderful cheering section at the Bobcaygeon Lock on Canada Day – they even arranged a band…just kidding (there was already one playing 🙂 We ate good food and drank a lot of Dave and Rob’s cold beer. We had a great time staying at Dave and Marilyn Kittle’s house. We base-camped from their house for a few days. Jude loved playing monster trucks with Aunt Marilyn. Jude and his cousin Carrie are building a farm. Geoff’s Aunt Bonnie, Mom (Katy is hiding behind Bonnie), Joyce Gordon (friend of the family), Michelle (friend of the family), cousin Robbie and his daughter Maddy met us at the Bobcaygeon lock. It was a great place to paddle into on Canada Day! Rane meets his great aunt Helen for the first time. Cousin John is sitting in the background. Aunt Bonnie, cousin Nicole, Katy (Geoff’s Mom)’ and cousin Jason came to the dock to wave us off as we left Bobcaygeon. From Bobcaygeon to Lakefield Geoff’s Aunt Jane and Uncle Paul English kindly put us up, fed and watered us, and provided endless entertainment for Jude in the form of visiting cousins! It was great! Geoff is pictured here with his Aunt Jane and little Rane. She and Uncle Paul borrowed car seats and ferried us to various locations to paddle. This enabled us to enjoy their company – in addition to delicious home cooked meals, A/C, showers, and lots of toys for the boys to play with. We had a visit at Aunt Jane & Uncle Paul’s house with cousin’s Joe and Cindy, and their kids Gillian and Cole. Gavin (cousin Greg’s son) is visiting from Toronto as well. Jude had a great time playing with his big cousins, Gavin and Cole. He loved the wooden sailboats they made him. Gillian was a big help with Rane. He enjoyed all the toys she played with him. From Lakefield through Peterborough Geoff’s Aunt Betty and Uncle Bob Hinton put us up in their beautiful cabin and shuttled us around the Peterborough area – big thanks to Jane and Paul English for loaning us the car seats for the kids. 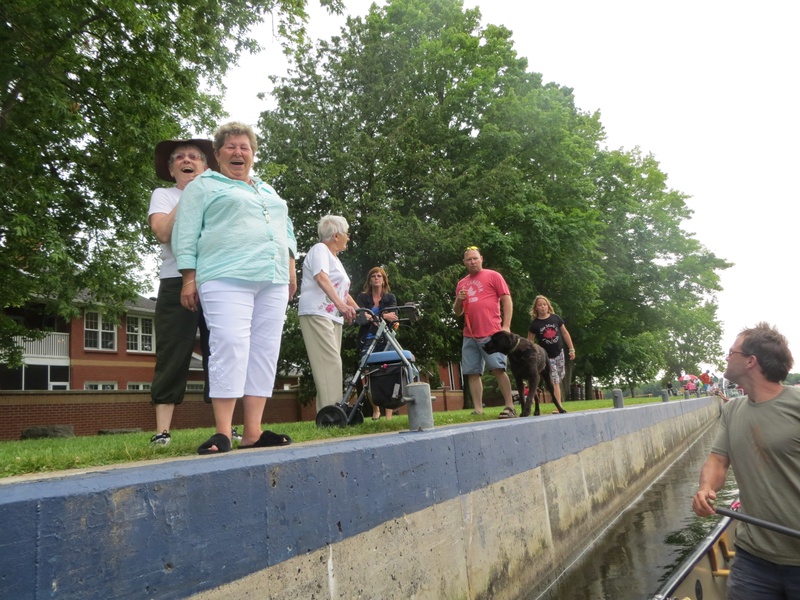 Aunt Betty and Uncle Bob visited us at a number of locks – they even braved a downpour with Jane (Geoff’s cousin) and Rick Lockett to offer us moral support as we passed through the Peterborough Lift Lock. We really enjoyed base camping at Aunt Betty (Geoff’s Dad’s sister) and Uncle Bob’s house. We took a day off to visit the Peterborough Canoe Museum. We had a nice visit at Aunt Betty and Uncle Bob’s cabin with cousin Jane and her sons Ryan, Brandon, and Cameron. Uncle Bob Hinton and Rick Lockett found a place at the Peterborough Marina to tie up for a night. They helped us unload our soaking wet gear after braving a downpour to see us pass through the Peterborough Lift Lock. On Canada day weekend, the Globe and Mail published an article about our trip. It led to several local newspaper stories, and a piece on Global National TV. For so much of Canada we have paddled in relative obscurity, but it has been heart-warming for us to see people waving and shouting encourageing words from their docks, boats, and bridges along the way. Thank you so much! Regrettably in many cases we couldn’t stop to chat: usually because we had at least one sleeping child on board and couldn’t risk losing precious tandem paddling time. It was a fellow cross-country paddler, Kristina Leidums, who put Roy MacGregor and photographer Fernando Morales of the Globe and Mail in touch with us. Though we have never met in person, in the last couple of years Kristina kindly shared her insights into areas that Pam and I were yet to paddle. Now, she has initiated a forum for so many Canadians to become acquainted with us, which in turn has meant that we have met so many kind people we otherwise would not have. Kristina, Roy, Fernando – thank you! The following list of people we need to thank isn’t complete. There were unfortunate cases where we didn’t get people’s names written on our charts when we met them. Our apologies. Thank you nonetheless. Bob Haugh called a greeting to us from his deck along the river. He caught up to us at the next lock and offered us a place to stay for the night. We were still base camping at Geoff’s parents house, or we would have definitely taken him up on it! Bob Clark and Janice Webb shared a cold beer with us (and a goblet of cold milk for Jude) before helping us carry gear and hold Rane. We hope the rest of the TSW was enjoyable with their new Cruiser. At the Orillia waterfront we had the great fortune to see Geoff’s long-time hunting friend Don Fournier and his wife Alda. It was also a co-incidence to see a close friend since high-school, Lisa Avery, as she ran through the park. Amazing! There is never enough time to see everyone, so we are happy to have had a quick visit with these lovely folks. John Bernhardt of Bolsover, invited us into his beautiful cottage for tea and cinnamon buns. Although our kids were having an off day, he and his son-in-law, Allan MacInnes, were gracious. Sidney, Robyn, Dawson, Tommy, Jim, and Doug Perry saw us paddle by their cottage on Grand Island. It was great of them to hop into their boat and come over to say hello. We enjoyed our chat under the Rosedale bridge! Nadine Dunk sent us an email inviting us to stop by their dock on our way through Fenelon Falls. We loved the sign they put out on the chair to welcome us. It was a lovely visit with the whole family including Tessa, who shares a birthday with Rane. Thank you for the snacks and cold drinks! A chance conversation regarding the location of the nearest bathroom with Amanda Rix lead to a bathroom break at her family cottage…this lead to meeting her whole family down at Hickory Beach. They were celebrating her mothers 65th birthday. Thank you to Anson Le for taking and sending the 2 pictures below. Geoff was surprised – I went to the bathroom with one lady…and returned 10 more!!! MacDonald Family pic at Hickory Beach. Note: The Wilson family is responsible for the revitalization of the beach. Nancy Austin saw us paddle by. She jumped into her kayak and paddled over to offer us a place to stay. We are very fortunate to meet so many open and generous people. RW Ollerhead saw us pass by at some distance on Sturgeon Lake. They had read the Globe and Mail article and decided to hop in their car to cheer us on from Sturgeon Point. Their big cheers made us smile. We met their daughter at a beach the next day. She told us what they had done. Thank you. We smiled and smiled as we passed! Yvonne Hienstra, Michael Zinlay, and Joanne Brown came out in a boat to bring us drinks and delicious snacks after seeing us struggle by in a nasty headwind on Sturgeon Lake. Thank you for lifting our spirits! Greg & Sam Row stored our canoe and gear for a night at their place on Pigeon Lake in Bobcaygeon. Their son, James, was very patient with our late arrival – we were late that morning because we had asked Katy (Geoff’s mom) to take us on a tour of the town she grew up in. It was a lot of fun. Once we were ready to head out, James kayaked out and took a few pictures. We hope he has a chance to send us a few? Aunt Jane and Uncle Paul called a friend, David Morgan, whose family owns Beachwood Resort on Lower Buckhorn Lake. He let us lock our canoe and gear up for the night on their property. Very nice place. Jude was excited to play with the trucks in the sand. We had a nice chat with Anne Garneau as she swam in front of her cottage. Stoney Lake is beautiful! David Reeves and his family waved us in with a warm welcome in a tough headwind. We thought we would make some extra kilometers that day, however, the wind had other plans for us. We regret not taking them up on their offer to stop there for the day. It was great to meet you, we wish we had seen David later that week at the canoe museum where he is a volunteer. Jack and Mary-Joan Hanson waved us in to say hello. Jude loves the bear shaped water bottle! David & Leigh Dobbin have a beautiful house with an extremely fun trampoline/water playground out front. David and his daughter, Rebecca, waved us in to say hello. The offer of cold draft beer and a sandbox for Jude to play in diminished our will to battle the headwind any longer that day. We greatly enjoyed a big play on this waterpark before heading out to paddle for the day. Thank you! Rick Lockett (Geoff’s cousin) met us at Youngs Point Lock and bought us ice cream cones on a hot day. Jude was thrilled with the pinball game he gave him. Clifford Skarstedt Jr. sent us some pictures he took of us for an interview with the Peterborough Examiner at Lakefield Marina. We really appreciate it since we don’t have many of us all in the boat together. Thank you to Armen for sending us a copy of the article his father-in-law, Arto Tersakyan, did for the Armenian newspaper called the Marmara. Allyson, Caleb, Greyden, and Kieran gave Jude and Rane a City of Peterborough pin. They braved the downpour to offer us an umbrella. It was really nice to see friendly faces amid all the grey. If you are reading this, I have misplaced your address and contact information. Please email if you have time. Jim Beam, Shane Wallace, Melissa McGill, Jack, and Darcy stopped to chat in their boat on the way back to their cottage after jumping off Bensfort Bridge. We were having trouble finding places to camp. They recommended Rainbow Cottages further down the Otanabee. Later they stopped to check if it was open, and ended up emailing us to let us know it was no longer open. It was really nice of them to take the time. Jeff Stock stored our canoe and gear in his yard. It is always nice to know our worldly possessions are in a secure place while we enjoy modern amenities. Rod MacDonald saw us paddling by and recognized us from the Globe and Mail article. He drove down to the Campbelltown public dock to flag us in, just as we were beginning to really worry about where we were going to camp that night. We really enjoyed the soft bed, shower, delicious fish (Rhonda took our surprise arrival all in stride), wine, and evening conversation. They lived on a sailboat for 18 months and had lots of adventures to share. We greatly appreciated all of the baby holding Rhonda did. We met Steve, Andrea, and Mike on the way back to the canoe. They asked us if we needed anything. It was kind of them to offer. Normand Locas offered us a cold beer, advice paddling the St. Lawrence, and held and played with Rane. We meet many nice people at the locks! Marg Eveson (pictured above in blue tank top) gave us lots of local info about restaurants and such. John and Jennifer Little stored our canoe in their yard for the night while we enjoyed a local B&B’s A/C. Jennifer also gave us some bottled water in the morning, and kindly allowed a Global News Correspondant to interview us on her lawn. Elise Wardell of Hastings House B&B went above and beyond the call of duty. She helped with the kids, carried gear, fixed us tea, and helped us order pizza door dinner. We really enjoyed our stay there. We met Ginny Clark at a lock at Peterborough. She thought her friend, Louise Campbell (Godesigns), would like to give us floating sun hats for our kids. They brought 2 hats to Healey Falls locks, along with delicious Tim Hortons donuts! Thank you very much for the great hats and delicious treats! Jude is wearing one of the hats from GoDesigns. Wayne Warnica of Campbellford chatted with us at the locks. He offered to put us up for the night, however, it was still early and we had miles to make. Karen is the Lockmaster of Haig’s Reach and Meyers Lock. She gave us cold water and freezies on a hot day. We appreciate her dropping off the bathroom key for us. Thank you for taking a few pictures of us with our camera. 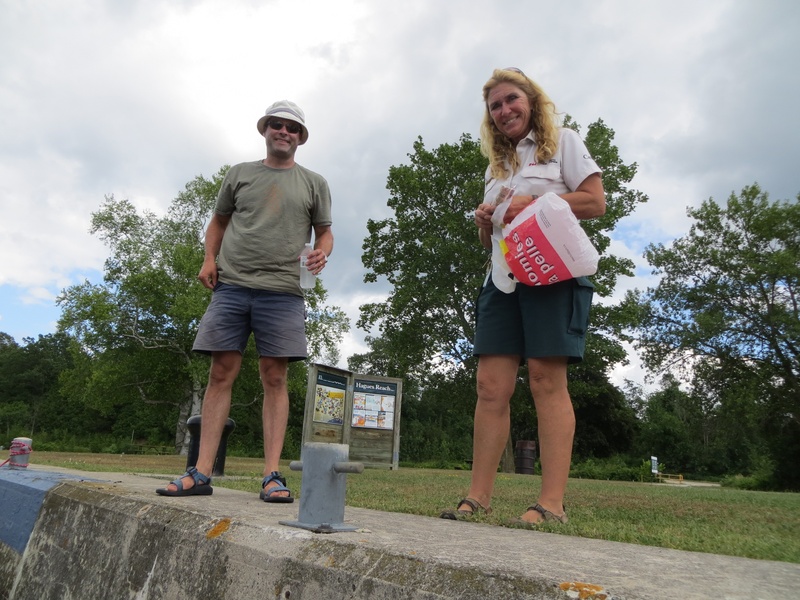 After a frustrating and unnecessary portage around a lock, we were happy we stopped to talk with Gord and Sally Wilkins of Ajax, ON. Thank you for brightening our day. Colin and Deborah Haskins greeted us in a paddle boat in Danger Narrows. We had a nice visit whereby we learned that Colin is an author. We are thrilled he gave us a copy of his book, Ferret Girl. In addition, he gave us a copy of his illustrators book, Piggy Hockey by Gerry Brophy. Doug Norman in “Afterimage” was right when he said that Jason Miller is a good writer. Hope you enjoyed the rest of your holiday! Once again, Bob (Geoff’s Dad) found us at a distant lock and resupplied us. He did a great job of holding Rane while we packed. We are incredibly grateful for all of the help of the Trenton area Lockmasters: Ian Kearse, Lucas Kuipres, Jim McConkey, and Aryanna Roth. They helped us get through the locks at the end of the day, stored our gear, and even helped carry it! Ian helped us find a hotel in the busy city of Trenton, even though he had a one week old baby at home. Carolyn, Chris, Ryley, and Sam Ross of Toronto, ON, jumped into their boat to bring us freezies and water on a turbo hot day on the Bay of Quinte. We definitely needed it! Steve and Debbie Whitney stored our canoe and gear in their yard for a couple of nights while we cooled off in Picton. Steve helped carry our gear. Local Raccoons were glad they did. We unfortunately left a bag of granola bars and vitamins with our gear. Debbie counted 21 raccoons, who no-doubt had bright yellow pee the rest of the day. Ingo and Anneliese Wagner gave us all a ride to the Picton Harbour Inn. In addition, they cooked us a delicious dinner at their beautiful home on Hay Bay. So kind of you to approach us cold on the glenora ferry and offer up your car and dinner table. Paula and Reg of Weedman Picton offered to drive us to our gear. Though we didn’t end up needing it, Thank you! Jane English (Geoff’s Aunt) gave us some stood advice to handle Rane’s brief temperature and teething. Katy found us the Telehealth number. Glad we didn’t need it, after all. Stay tuned for our next update about the Rideau Waterway! I think you are one courageous (and crazy?) family doing this incredible trip! I would like to see you when you get to Montreal. When will you be coming through do you think?